Your home’s landscape and exterior space is the first thing that potential buyers notice. As they pull up to view your home, it is important that you are giving them a great first impression. These are a few great landscaping renovations that you can make to improve the chances of selling your home. A thorough, deep cleaning can go a long way in terms of improving the value and appeal of your home. Not only does power washing improve your home’s curb appeal, but it also can prevent mold from growing and keep your gutters in good working condition. The National Association of REALTORS® estimates that power washing the exterior of your house can add between $10,000 and $15,000 to your home’s value, making it a great improvement choice. The most important exterior features to focus on include the siding, sidewalks, driveways, and any patios or decks. Overgrown bushes and trees not only block the exterior of the house that you have worked so hard to improve, but they can also reduce outdoor views from the inside. Planting new trees can also appeal to homebuyers. 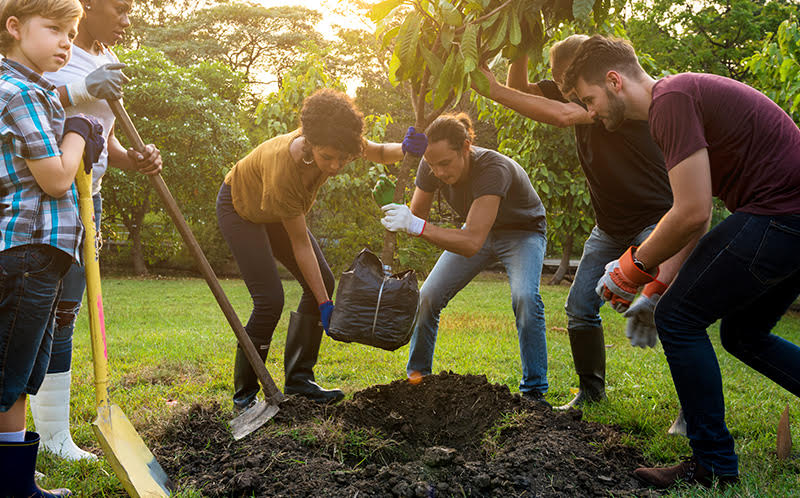 Large trees tend to be low maintenance, yet they provide many home advantages including reduced energy bills, outdoor shade, and improved air quality. Keeping your grass green and trimmed is another great practice for landscaping maintenance. It might be useful to consider the services of a local professional landscaping company while your home is active on the market. Outdoor entertainment spaces can increase demand, thus increasing the resale value of your home. Even designing a small patio space with seating is a great “Do It Yourself” project that can increase your home’s appeal to potential buyers. There are outdoor space projects available for all budgets, with many housing trends using concrete and colored staining methods. An outdoor entertainment space with shade or a screened covering is also likely to be a popular trend this year. The National Association of Landscape Professionals lists climate cognizant landscaping, such as pergolas and retractable outdoor spaces as one of the top resale trends of 2018. Bright and clean flower beds encourage people to feel at home. When people feel comfortable, they are better able to imagine themselves living there. When flower beds are messy and unmaintained, potential homeowners may be reminded how much work they will have to do upon moving in. Freshen up the mulch, plant some brightly colored flowers, and remove any sprouting weeds. Colorful flower gardens are also expected to be a top 2018 landscaping trend. Even better are low maintenance flowers like Old Gold Junipers and black-eyed Susan’s. Sunfinity sunflowers are a popular choice as a brightly colored flower that is easy to maintain year-round. Upgrading a home’s irrigation system is often overlooked, but, may improve resale value. It is important to maintain and sustain your landscaping improvements. An upgraded irrigation system can help you do just that. Irrigation systems also get the most water efficiency, which can be a huge selling point saving buyers both money and time when it comes to yard maintenance. Landscape lighting illuminates the exterior of your home. It can improve curb appeal, functionality, and the safety of your home. Use your exterior landscape lighting to highlight the most important features of the home including the front door, windows, and walkways. Consider things like the light’s color temperature, effects, and wattages when choosing your exterior landscape lighting. Your home’s landscaping affects its curb appeal. The first impression that you give potential buyers will influence their desire to purchase and the offer amount that they are willing to make. Upgrades that improve the landscape can increase your resale value and sell your home faster in the market.